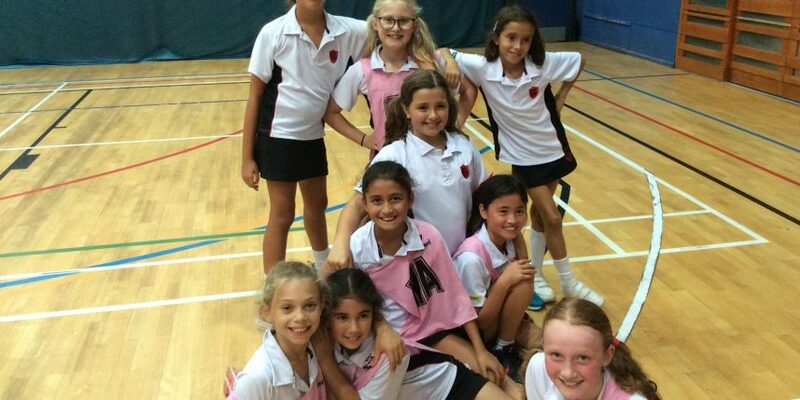 This week year 3 girls took part in a netball tournament on-site. The classes were mixed into three equal teams of seven players and each team had the opportunity to play a ten minute long match against the other two opposing teams. The girls had the chance to play in a variety of positions across the court and were coached throughout. The first match took place between teams Saturn and Neptune, all players were energetic and excited encouraged by team Mars from the side lines. The second match was between Mars and Saturn and then the tournament was finished off with Neptune playing Mars. There were plenty of shots at goal from all teams, but the winning goal was scored by Ailyn from the Shorelarks! The teams finished off the matches by taking part in a short netball quiz to earn extra points. The teams needed to answer questions relating to netball rules or positions which they have been learning about during weekly sports lessons. The winning team was Saturn with only one point ahead! It was a brilliant afternoon of netball in the sunshine which all of the year 3 girls should be extremely proud of. We are now looking forward to starting the year 3 girls netball fixtures after half term. Year 3 boys traveled to Linford Christie on a lovely sunny autumn afternoon to participate in three football fixtures in a round robin inter-house tournament. The enthusiasm, commitment and team work was evident to see, along with a strong desire to win! Each house played some good football, goals were hard to come by due to good solid defensive play from all houses. The overall standings were close, however Blenheim came out winners in what was a fantastic afternoon of football. Twelve children across year 3 and 4 travelled to Battersea Park to participate in a football tournament against various schools across London. The boys played seven games of 15 minutes each, the year 4 team progressed well against some strong opposition. They came out with two draws and five losses, however putting in some impressive performances against Falcons and Prospect House ended the tournament on a high. Seb bagging two goals and Edward nailing a goal home against Falcons. Tarun and Charlie were ever reliable in defence, making a host of great tackles and working tirelessly to win the ball. The year 3 team were consistently brilliant throughout the tournament, working amazingly as part of a team as well as providing some magical brilliance from individuals. Max and Anton put in a host of solid performances and Matthieu excelled in attack, Sam bagged a couple of goals in attack to round off an excellent set of displays from the year 3 team. Overall a fantastic experience for all the boys and to play against a range of challenging opposition will stand them in good stead leading into their remaining fixtures.